After eliminating all other possibilities, the one remaining-no matter how unlikely-must be the truth. First I’d like to thank Chris for being such a great host. Next I’d like to thank Dave and Lexie for showing us around Monterey Bay. It looks like I was able to escape part of the Seattle heat wave this weekend. I flew down to the bay area to visit Chris and Dave. I’ve been meaning to visit Chris and the bay area for some time. When I went back to LA in May, Dave had mentioned he had a hapkido tournament in Berkeley sometime in August and I thought it’d be great to meet up then. After some coordination, the trip was set. I flew into SJC. The airport was really nice and apparently I was in the new terminal because Chris didn’t even know the terminal I was at existed. On my way back, there was also a lady standing in front of my gate telling people getting off the plane that this was the new terminal and they should definitely check out the bathroom. A bit weird, but okay… It was also awesome that SJC had free wi-fi. The only thing I wanted to check out in Berkeley was Ryowa, a really good ramen place. When Chris mentioned that there was a Ryowa in Mountain View, we knew we had to go there for lunch on Friday. The ramen was awesome as expected, but I was sad that the special fried chicken was only offered during dinner on weekdays. Mmmmm, special fried chicken. Next time! Update: Forgot to mention that while eating ramen, I get an unexpected call from Derek C. Apparently he’ll be in town the same weekend Darryl and Heang are coming up. Sweet! Dave and I hung out at the Valley Fair mall and Santana Row while we waited for Chris to get off work. Santana Row looked very familiar and when I saw the Maggiano’s, memories of eating there came back. It wasn’t until I saw the Ramada Inn next to Mercado that I began to piece things together. The memory is still a bit fuzzy, but Carol, Dave, and I apparently took a trip to visit the Monterey Bay aquarium a few years ago. Along the way, we thought it’d be nice to visit Chris, but it turned out he was out of town. Apparently the hotel we stayed at is literally just ~5 mins from Chris’ current apartment. The highlight of this trip was getting Chris drunk. We had dinner at this really good Indian place in Santana Row called Amber India. After dinner, we tried looking for a quiet bar where we could sit and chat, but was unsuccessful in locating one. We opted to pick up some stuff at the supermarket and chill at Chris’ place. We picked up some rum and coke and went back to watch Role Models on Dave’s laptop. It was like back in our old college days. I don’t think we ever finished the movie, as chatting and catching up was so much more fun. Dave passed out on the couch and after a bit more chatting, we all hit the sack. 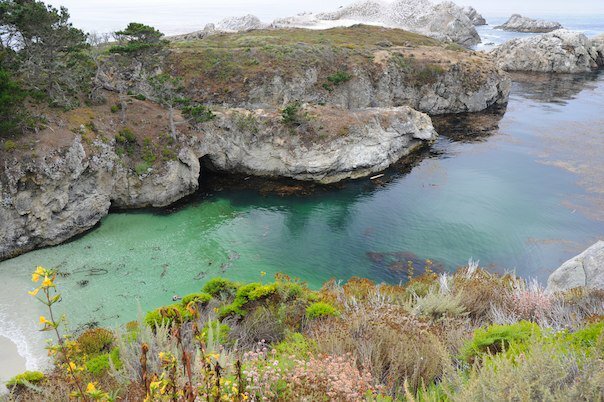 There were originally plans to drive up to San Francisco, but being unable to decide what we wanted to do in the city, we opted instead to go down to Monterey Bay and check out Point Lobos and the Purple Beach. We met up with Lexie and she was an awesome guide! 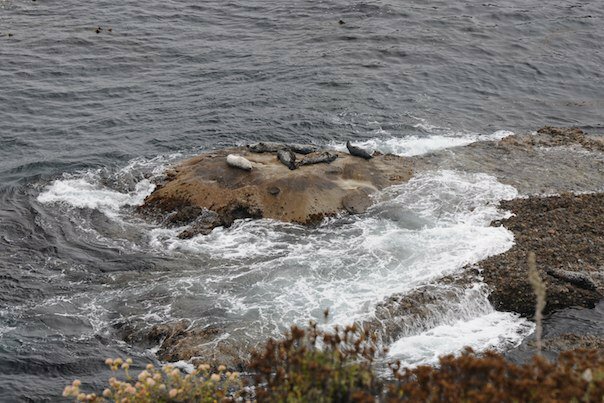 We learnt really interesting tidbits about the area, why there were currently so many seals and sea lions around the area, how to spot whales from land, what the difference between a seal and sea lion was, and so on. Did you know that seal’s pectoral fins (flippers) are less developed compared to a sea lion? As Dave would say, seals are like sausages in the sea, flopping around. Also apparently seals don’t make much noise if any, and if you hear barking, it’s most likely from a sea lion. Lexie’s also about to begin training sea lions and dolphins to tag sea mines which sounds so cool! I was sad I wasn’t able to try out Lexie’s Banana Chocolate Chip Walnut bread that Chris and Dave praised so highly about. Before leaving Monterey, Lexie and Dave recommended Turtle Bay Taqueria for dinner. They had some really good Mexican seafood dishes. Their salsa was awesome too. They had this really hot salsa called X’nipec (meaning dog’s nose or something like that) and you just can’t stop eating that salsa, because it’ll burn like crazy. We didn’t get back to San Jose till later in the evening. Since neither Chris nor I could ever decide on anything, I suggested watching Inception. Chris hasn’t seen it yet and I had wanted to rewatch it for some time. I also got Chris to invite his friend who had also wanted to see Inception and she joined us on the adventure. It was just as awesome as the first time and this time I picked up on the several new parts which I had missed. I still couldn’t make out what Mal said during the train scene. I swear to god I still hear her shout, “You’re the devil.” Guess I’ll have to wait for the DVD/Blu-ray. Things definitely close way too early in San Jose. We were trying to find a coffee shop or boba place after the movie, since how can you not have discussions about the movie after something this epic. Both Yelp and Urbanspoon failed us. Everything close by appears to be closed by 10, even on a Saturday night. Unfortunately, we had to part ways after the movie. On my last day down in the bay area, I requested we go to In-n-Out for lunch. Mmmmm. It’s been years since I had In-n-Out and the burger was awesome. Zagat just released that Five Guys beat In-n-Out, taking the crown for the best fast food burger. There’s actually a couple Five Guys here in Seattle. Should definitely check them out sometime. After lunch, we drove to Half-Moon Bay and hung out at the beach for some time. In retrospect, it would’ve been awesome to have brought a football with us or anything to throw around. Finally it was time for me to go home. I wasn’t looking forward to returning to 90F+ weather after being in the bay area which was 78F and sunny. Look what happened to the soda can I left in my car! When I got back to my house, my thermostat registered 89F (this was at 9PM). After opening all my windows and waiting half an hour, it dropped back down to ~80F. Listening to the Inception soundtrack and falling asleep on the plane is awesome, especially when there’s a screaming kid sitting across the aisle. According to my Zune, I’ve listened to the entire album 50+ times already. I got a bit sunburnt again, but not too bad, just a reddish hint. It looks like I found some new travel buddies. One of the many conversations we had that night was about traveling. There’s a lot of places I would like to visit, but I hate traveling alone. Traveling with companion(s) is so much more fun as you get to share the experience. So Chris, Dave and I were talking over places we’d like to visit. (Side note: For some reason I thought Dubai was in Africa, but it’s really in the Middle East.) Anyway, we decided to start small, with places in the US (New York, D.C., Chicago, Boston, etc.) and then move onto far away lands (Australia, Asia, Europe, etc.). On a similar but unrelated note, we’re trying to plan a snowboarding trip up to Whistler in December or January.